Add “Breaking News” and “Video” columns in “News & Announcement” page. Users can view important news and videos of WaykiChain conveniently. Completed the upgrade of background management system. Supported separate TKD searches for news and articles. On Jan 5, 2019, to celebrate one year anniversary of WaykiChain, the “WaykiChain One Year with You” themed activities and interviews were officially released. From Jan 1, 2019, WaykiChain daily news was upgraded to voice broadcast. Five mystery broadcasters from WaykiChain are going to report the latest blockchain news everyday. @Version was 82% completed; Designed the guidance for beginners and opened growth time for each system. Tested the property system and early-stage task system, and modified the time of growth levels. Allocated the property and output of systems and enhanced inter-system correlation. Optimized game interface performance and UI. Added TKD configuration, video upload function, breaking news upload function for official website management system, and completed the connection of front end. Built the front and back end service framework that can automatically deploy WaykiBet; the basic deployment of the entire process has been achieved, the current overall completion: 95%. Launched WaykiChain public chain bug bounty with highest reward up to 80,000 RMB. Reached cooperation with “Proginn.com” platform, and the blokchain training courses of WaykiChain will be released on Proginn.com. Tech team has received registrations of the explorer plug-in development task, and is currently selecting participants. Further optimized the Chinese documentation of Developer Portal and completed 50% of the English documentation. iOS and Android library development of WICC wallet library is completed; Go language library is also coming to an end. Added “decoderawtransaction” function for the public chain node program to help developers reversely parse the contents of a signed transaction data string. Removed a expired service address for IP discovery from public chain code. Launched the development of public chain Kotlin version, and realized the integration of LevelDB access and JSON-RPC interface framework. To test and fix bugs for WICC wallet library go language version; To conduct research of js language library function; To debug smart contract deployment RPC interface. To completed the development of developer community English version. To complete the one-click deployment of WaykiBet. Start to build an automated test framework for smart contracts. 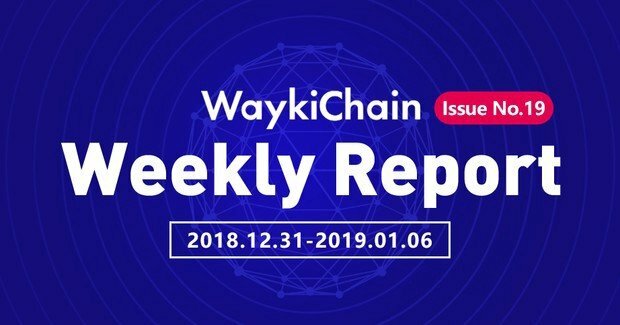 WaykiChain project overview English version has been completed and will be released globally soon. Released “WaykiChain Winter Energy” video promotion campaign, with a total of 11,663 impressions and 741 interactions. WaykiChain overseas developer contest is in preparation (30% completed), and is expected to launch in the near future. WaykiBet FOMO contest was successfully completed. It lasted for 3 weeks and received 172 reports from 1000+ overseas users from the US, Russia, India, Indonesia and Vietnam. The average user experience rate is 8.4 (out of 10). Opened official account of WaykiChain in Feixiaohao community. Opened WaykiChain’s special column on “Proginn.com” platform. Entered Chinese IT technology community CSDN. Upgraded WaykiChain daily news to voice broadcast. Made and promoted the H5 video for WaykiChain one-year anniversary. Conducted and promoted the WaykiChain one-year anniversary interview of management team members. Held the torchbearers recruitment activity for WaykiChain one-year anniversary. Held the online “Torch Relay” activity for WaykiChain one-year anniversary. Held the award-winning quiz activity for WaykiChain one-year anniversary. Held “Scan & Follow” bounty activity for WaykiChain one-year anniversary.